mYPads are an innovative solution to homelessness and the lack of affordable housing for young, single people living in London. 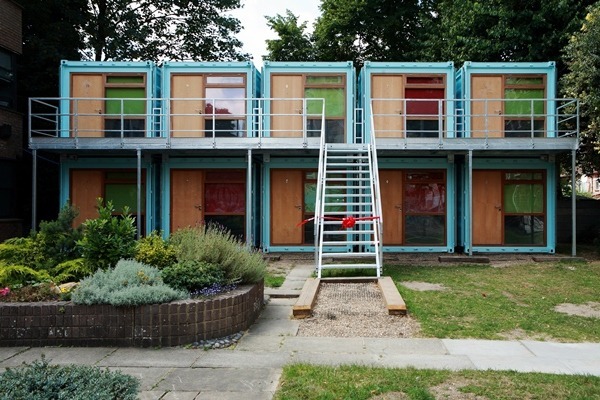 We have converted shipping containers to high-specification single-occupancy units containing a bed, storage space, a wet-pod containing a shower and sink and limited cooking facilities. Find out more here. Who can apply to become a mYPad resident? We have 20 mYPads we are designating for young, working people who are currently unable to privately rent, are not owed a homelessness duty by the council and find themselves facing homelessness. Residents in a mYPad will have their licences reviewed every 3 months to ensure they are still suitable for the project and licences will last no longer than 1 year. These mYPads cost £126.69 a week to rent, including utilities, plus around £14 a week council tax, allowing residents to save a deposit for more permanent accommodation. New residents will be required to pay the first week’s licence fee the day they move in. Unlike the rest of YMCA East London’s accommodation, mYPads are not supported housing, meaning you will not have a Supported Housing Officer and access to other support services, and you will be responsible for paying the entirety of your licence fee directly to us. There are no laundry facilities. You are welcome to become a member of our gym. You can apply to become a mYPad resident by downloading and completing a mYPad Application Form 2017 Either email your completed form to applications@ymcaeastlondon.org.uk, or hand it in to reception at our Tower Hostel at 642 Forest Road. Your application form will be accessed for eligibility. If you are ineligible to apply then you will be informed. If you are eligible, we enter your details onto our system and place you on our ‘waiting list’. We will contact you when your application approaches the top of the list to see if you still require a mYPad. You will continue to rise up the waiting list and we will contact you when a mYPad becomes available.